Nicolas Poussin (1594–1665), The Israelites Gathering the Manna in the Desert (detail) (1637-9), oil on canvas, 149 x 200 cm, Musée du Louvre, Paris. Wikimedia Commons. With some notable exceptions (such as Judith and Holofernes), stories taken from the Old Testament have declined in popularity with narrative painters since the time of Rembrandt. The markedly (perhaps inevitable) Christian bias in European art, and decreasing familiarity with the Old Testament have contributed to this decline. However, some of those stories are among the most enthralling, and present the greatest challenges to the visual artist. My example for this article is the account in the book of Exodus of the manna provided to feed the Israelites when they might otherwise have starved to death in the wilderness. Painters have relied on the account in Exodus chapter 16, supplemented sometimes by additional material in book 3 of Josephus’s Jewish Antiquities. At that time, the Israelites had left Egypt, crossed the Red Sea, and were travelling en masse across the desert: extremely hostile terrain for even a small group of fit, young people, and a disaster waiting to happen for the many families with babies and young children, and the aged and infirm. They fell into despair, and that turned to anger against Moses, their leader, and Aaron, his older brother. They were therefore provided with water, and with quails, but the mainstay food was the fine, white manna which covered the ground like a heavy frost. Although manna was lifesaving, it was also an ordeal, because the Israelites were given strict instructions as to how they were to obtain and use it. If they failed to follow those instructions, then they would go without. The Israelites thus had to put total trust in God, and be completely obedient. Manna fell overnight, and had to be collected from the ground the following day. Each family member was entitled to a standard volume, of about 3.6 litres, and must not try to collect any more for themselves, as any excess would vanish. Each day, they were to eat all their allotted ration; they could not carry any over to supplement the next day, as it rotted. The exception to this was on the day before the Sabbath, when they had to gather two days’ worth, and the second day’s ration did then last through the Sabbath. There was, accordingly, no fall of manna on the night before the Sabbath. The Israelites quickly accepted these rules, the manna fell reliably, apparently sufficient to keep them alive and well for the forty years they spent in the wilderness, and they put their trust in Moses, Aaron, and of course God. The fall of manna also has potential metaphorical interpretations. Apparently its distribution and the effort needed to collect the manna varied considerably, suggesting that it might be a symbol for the God-given ‘talents’ of individuals, and for life more generally. Thus it can be seen as an indication of the need for individuals to accept what they are given, rather than always wishing for more or better. the people recover their trust and are grateful. Bernardino Luini (1485–1532), The Gathering of the Manna (1520-3), fresco transferred to canvas, 198 x 182 cm, Pinacoteca di Brera, Milan. Wikimedia Commons. 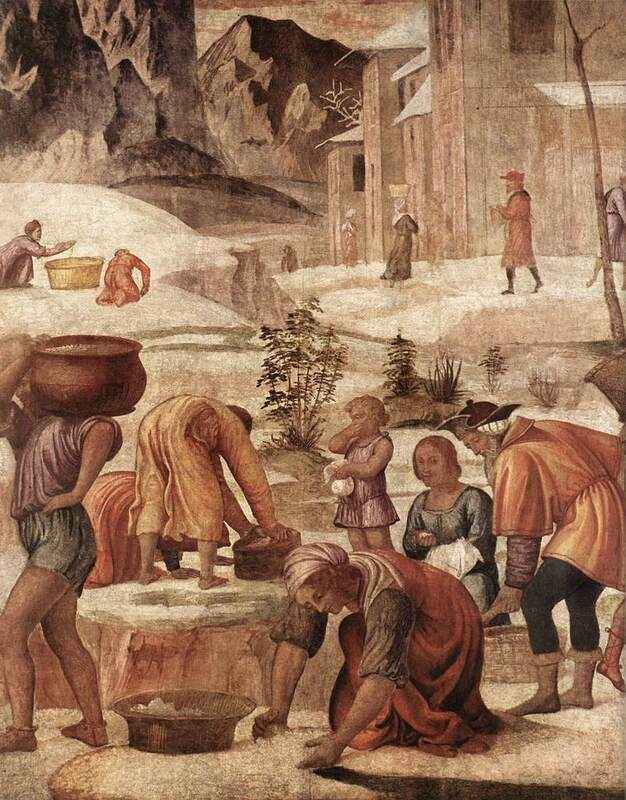 This early Renaissance painting shows family members, young and old, collecting manna from the snow-like deposition around a permanent town. It is plain and simple, telling its basic story according to the Biblical account, of the third phase above. Agnolo Bronzino (1503–1572), The Falling of the Manna (1543-5), fresco, 300 x 175 cm, Palazzo Vecchio Museum, Florence. Wikimedia Commons. 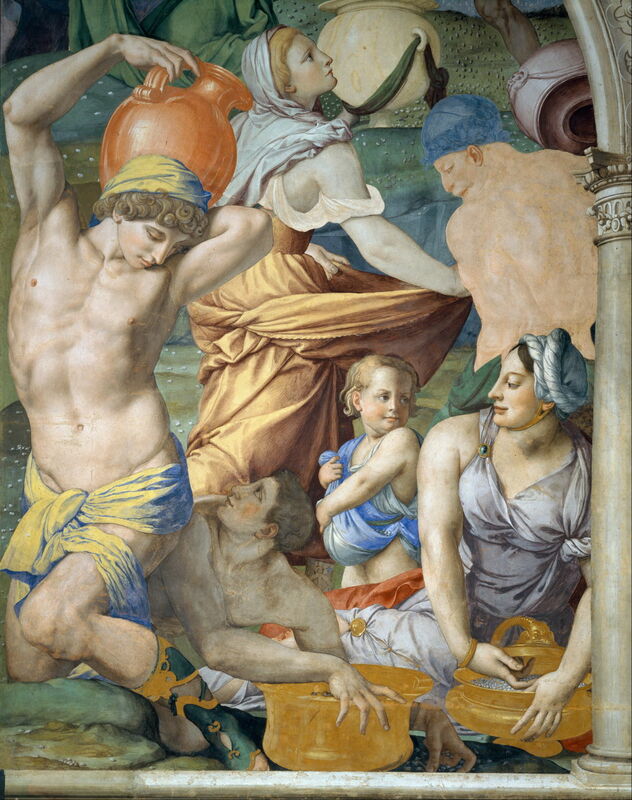 Bronzino’s slightly later fresco adopts a similar approach, looking at the processes and mechanics of the collection of manna, as in the third phase again. Francesco Bacchiacca (1495–1557), The Gathering of the Manna (c 1540-55), oil on canvas, 111.8 × 95.3 cm, The National Gallery of Art , Washington, DC. Wikimedia Commons. At about the same time as Bronzino was painting his version, Bacchiacca was attempting something more novel and ambitious. Moses holds his staff as a pointer, at the lower left, which leads us to a menagerie of exotic animals. There are signs of manna being gathered, and a group of people are sat behind Moses apparently approving of the way that things are going. This covers the third and fourth phases above, but the relevance of the animals to the narrative is unclear. Maerten de Vos (1532–1603), The Israelites Gathering Manna (1570-5), oil on oak panel, 153.7 x 158.2 cm, Alte Pinakothek, Munich. Wikimedia Commons. This panel shows an even better-developed story. 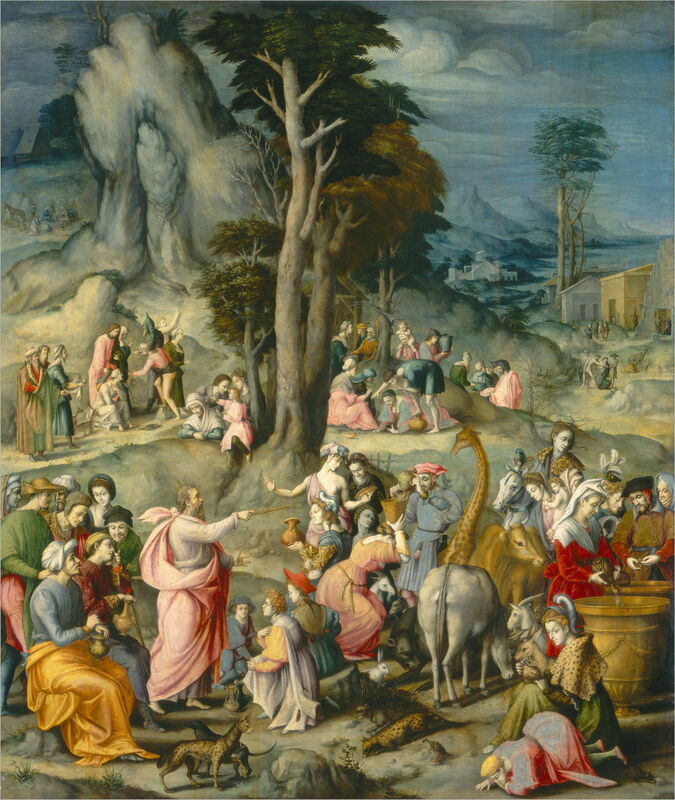 Moses, pointing again with his staff, and talking to Aaron, who wears a bishop’s mitre, is to the left of centre, in the middle of a sprawling mass of people. 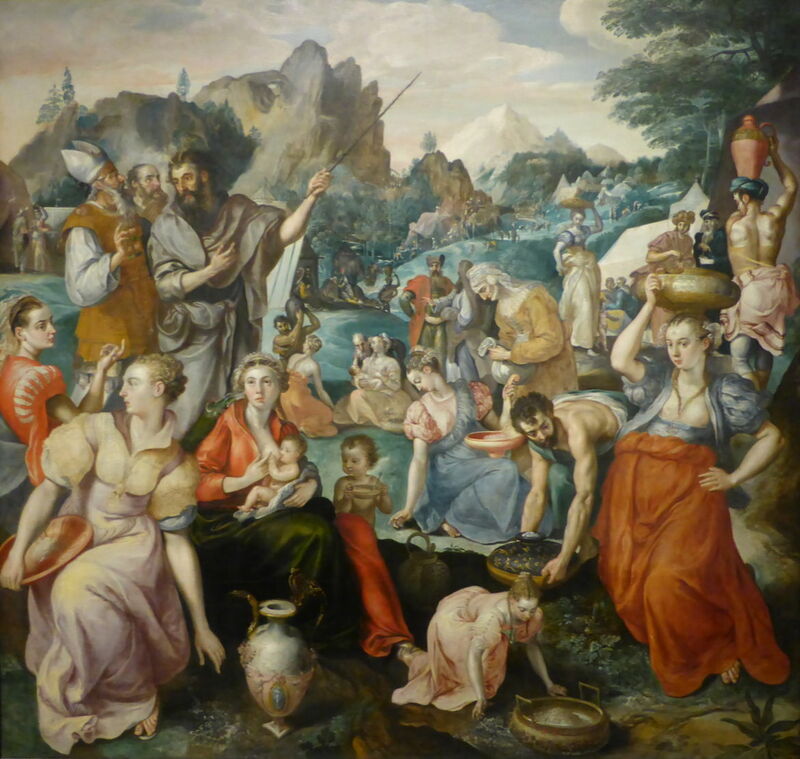 Those Israelites show many different activities associated with the gathering of manna, and just in front of Moses a young mother nurses her infant at the breast. But that is as far as it goes. 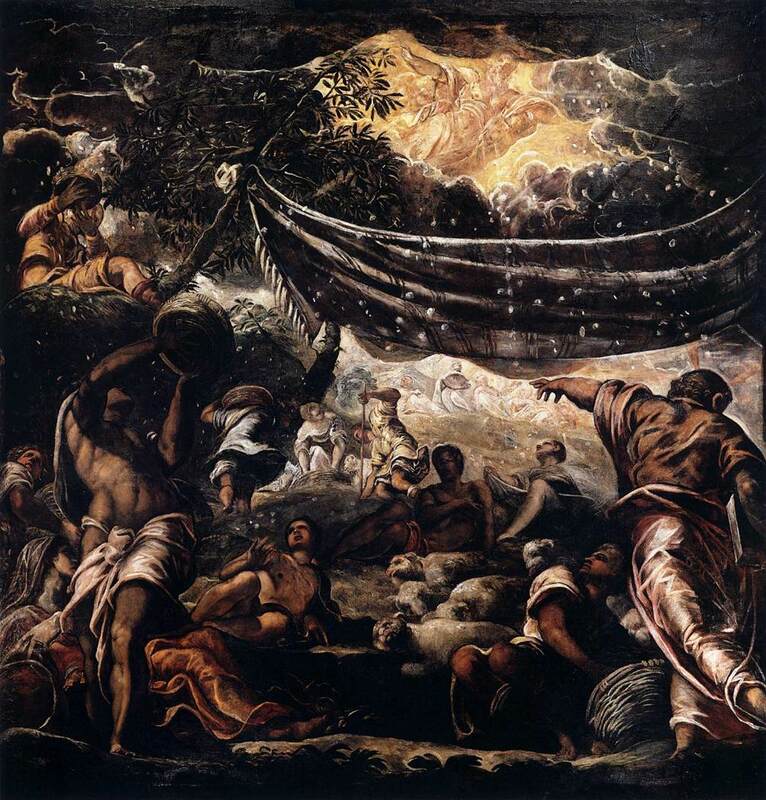 Tintoretto (1518–1594), Miracle of the Manna (c 1577), oil on canvas, 550 x 520 cm, Scuolo Grande di San Rocco, Venice. Wikimedia Commons. This spectacular ceiling fresco is the first painting here to include the significant detail that the manna fell during the night, and the first to introduce the figure of God. 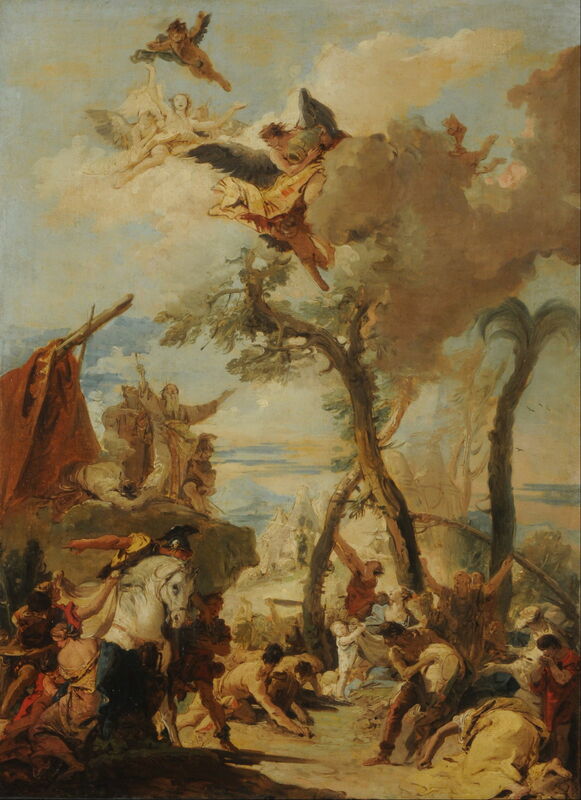 All the previous paintings assumed that the viewer knew that manna came from heaven and was the gift of God: here, God is shown scattering the manna from heaven. Its coverage remains confined to the third phase enumerated above. Guido Reni (1575–1642), The Gathering of the Manna (1614-15), oil on canvas, 280 x 170 cm, Duomo di Ravenna, Ravenna, Italy. Wikimedia Commons. Later still, Reni has shown small groups (among his multitude) with more varied reactions. Those seated close to Moses are praying and looking up to heaven, as if they are still waiting for manna to appear. 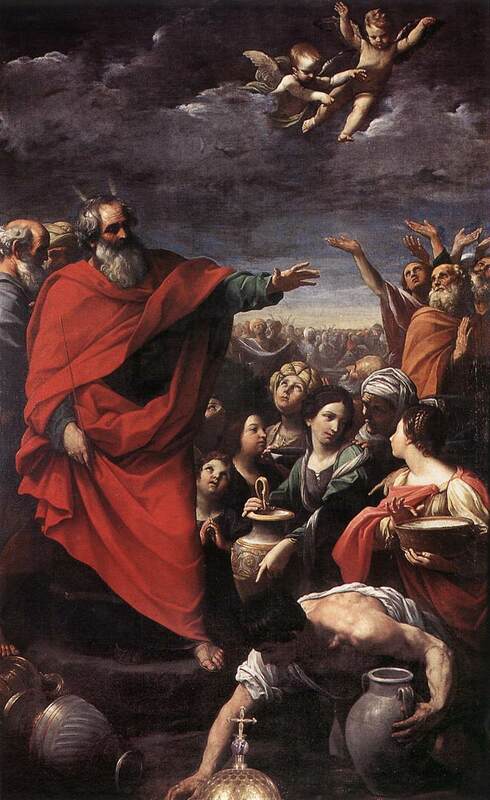 The three people to the right of those are talking to one another, and the woman in green is pointing, leading our gaze down to a young man gathering manna by Moses’ left foot. Behind them is a group of older men, their hands raised up in appreciation of the falling manna. This is starting to become a more complex story, in which different events from the full Biblical account are being expressed in groups of figures. Although these groups are packed together on the canvas, making its reading harder, the story does now cover phases two to four. 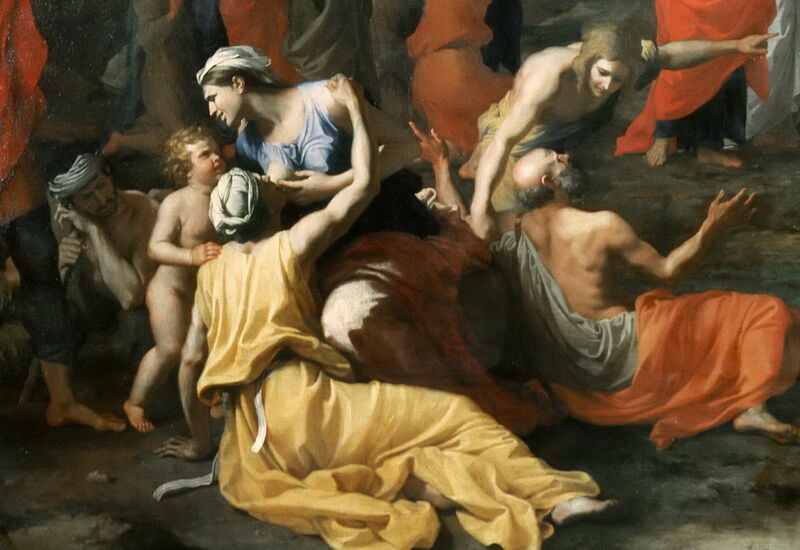 Unusually for Poussin’s works, we have some insight into his intent in this painting. In a letter of about 1637 (and repeated in a 1639 letter to Chantelou, who commissioned the painting), he revealed that he was showing the starved state to which the Israelites were reduced (phase 1), the joy they experienced when the manna was provided, and its effect in improving their respect for the leaders (phases 3 and 4). He also had insight into more interpretative aspects, referring to the gathering of the manna as uniting diverse elements in the group. However, he cautioned that the viewer would need to read the painting in order to obtain that understanding, and gave clues in his use of tenses that his depiction would not show a single moment in time. These are examined in detail by Mitchell and others. 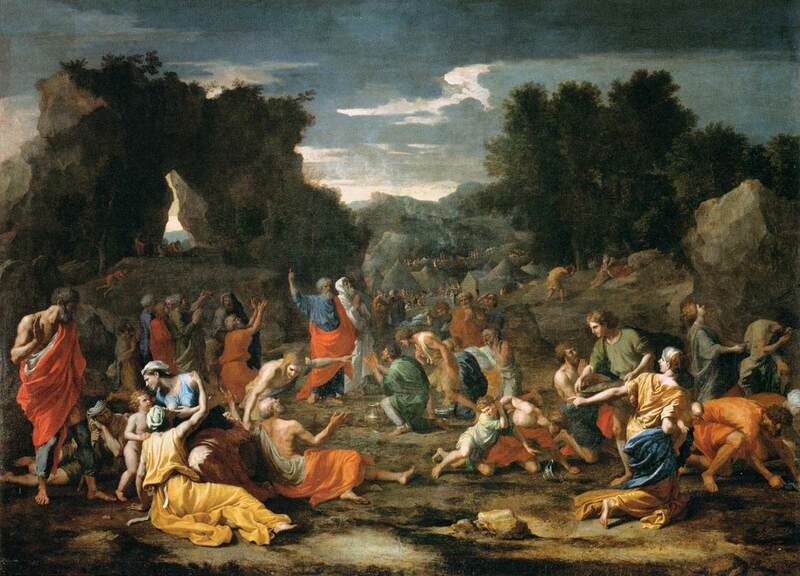 Nicolas Poussin (1594–1665), The Israelites Gathering the Manna in the Desert (1637-9), oil on canvas, 149 x 200 cm, Musée du Louvre, Paris. Wikimedia Commons. At first sight, his painting may appear as disordered as the hundred or more figures which he has included. But Poussin uses colour and light, together with signs in body language, to guide our gaze through its complexity. Closest to us, at the left, is a group of five figures who are still battling with starvation. Among these is a woman with a toddler, who is suckling not that infant, but her aged mother, wearing the yellow robes. Recall the feeding mother in de Vos’s painting above, although Poussin may never have seen that work himself. To the left of the child is a man who might have come from Géricault’s Raft of the Medusa, propping his head against a stick. To the right is an elderly man, being helped up by a woman who is pointing to the right of the painting, although he is pointing back (towards Moses and Aaron), still asking what their leaders had done to address their predicament. Follow the woman’s pointing arm across to the right of the painting, and there is a larger group who are brightly lit and brilliantly coloured. The foreground contains nine figures who are busy gathering the manna in the way prescribed by God. Two of them look up to heaven and express their gratitude, but two younger men (or older boys) are fighting to collect their day’s ration, and others seem to be reminding them of the rules. The woman in yellow is here pointing back at the first group to complete the link between them. 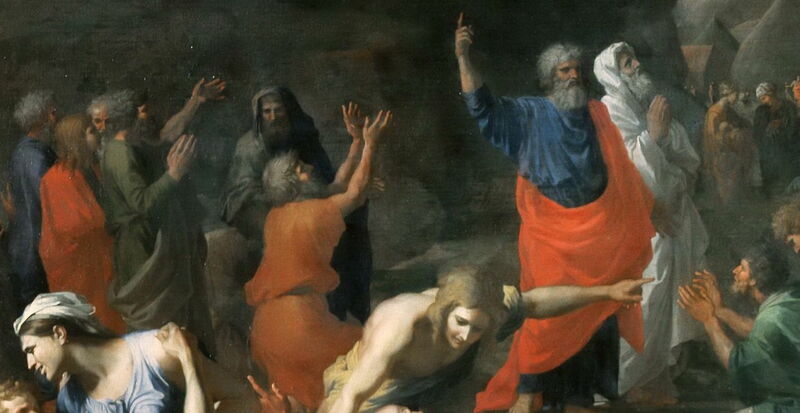 Behind and to the left, a cluster of about eight men seem to be expressing their gratitude in deliverance, and some look left and up towards the figures of Moses and Aaron. The two leaders, brightly lit and coloured, stand slightly further back. Behind them, to the left in the painting, are some fans, their hands raised to heaven, applauding Moses and Aaron. 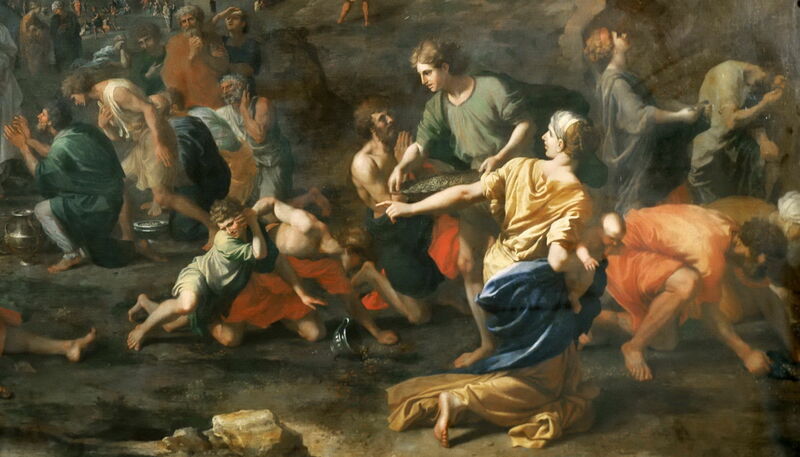 Deeper into the painting are other small insights into Poussin’s narrative: a figure resting on the ground, still apparently too weak from hunger; various individuals and groups engaged in the harvest of manna; a tented village appropriate to their temporary and nomadic existence. The landscape is harsh, rocky, and looks unforgiving. There are further details which you can read, and several excellent accounts to help you do so. But it is clear that Poussin abandoned temporal unity – his painting does not depict a single moment in time – in order to tell us the complete story. In doing so, he alone has depicted the peripeteia, the dramatic improvement in the fortunes of the Israelites. This proved controversial soon after his death. The French Académie Royale de Peinture at de Sculpture organised a series of lectures and debates on his paintings in 1667, and devoted one complete session, led by Charles le Brun, to consider this painting. Le Brun’s lecture was recorded by André Félibien, published in a book of the lectures and in Félibien’s biography of Poussin. It has been the basis for research, comment, and debate ever since. Giovanni Battista Tiepolo (1696–1770), The Hebrews Gathering Manna in the Wilderness (c 1740), oil on canvas, 92 x 67 cm, National Museum of Fine Arts in Buenos Aires, Argentina. Wikimedia Commons. 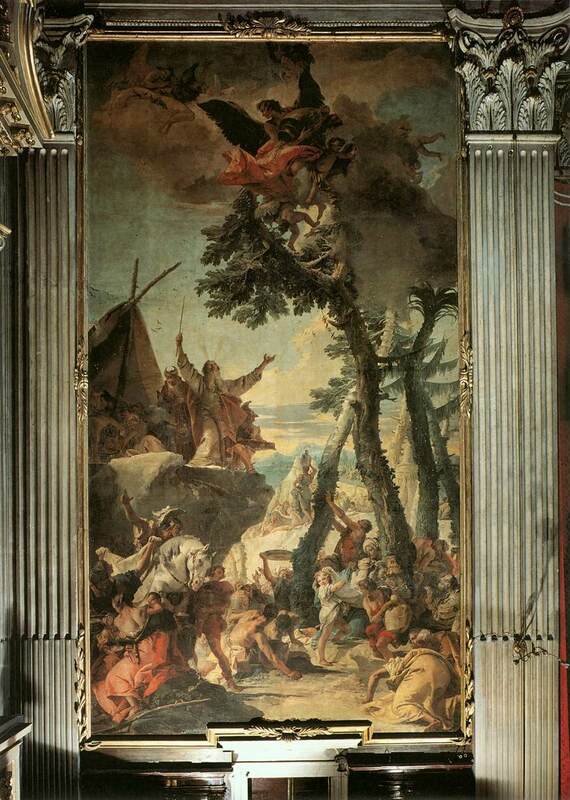 Giovanni Battista Tiepolo (1696–1770), The Gathering of the Manna (1738-42), oil on canvas, 1000 × 525 cm, Parrocchiale, Verolanuova, Italy. Wikimedia Commons. This is an ambitious work. The figures are divided into four groups: those at the top of the tree include an angel, who seems to be delivering the manna from heaven. At the foot of the tree, another group is engaged in collecting the fallen manna. Moses leads a third group, stood on a rock shelf at the left. The final group, whose role is less clear, is centred on a white horse at the lower left corner. 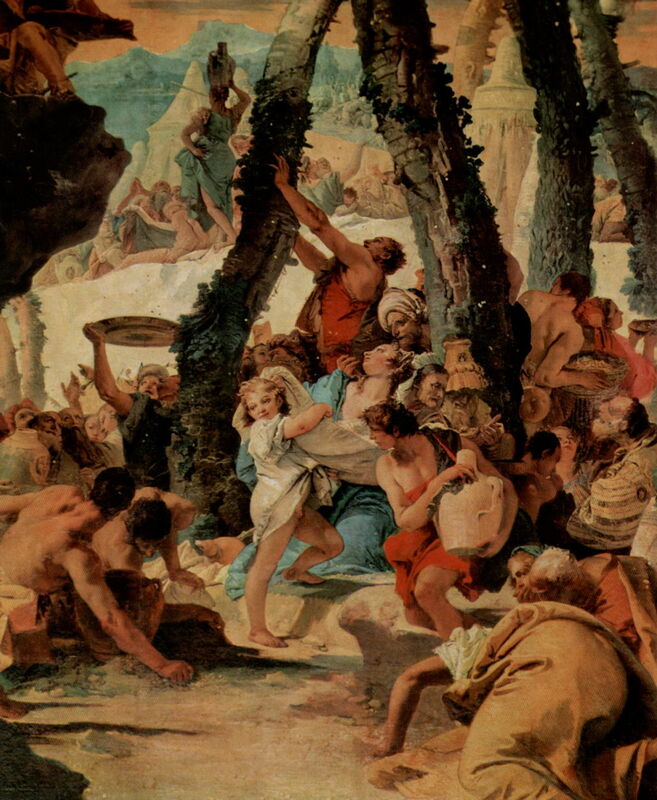 Giovanni Battista Tiepolo (1696–1770), The Gathering of the Manna (detail) (1738-42), oil on canvas, 1000 × 525 cm, Parrocchiale, Verolanuova, Italy. Wikimedia Commons. This detail shows various means of collecting the manna, using fine nets, holding large salvers up in the air, and scraping it up from the ground. It is rich in detail from the third phase, covers the fourth, and may hint at the second, but dodges the first. Jacques Joseph (James) Tissot (1836–1902), The Gathering of the Manna (c 1896-1902), gouache on board, 29.1 × 24 cm, The Jewish Museum, New York, NY. Wikimedia Commons. 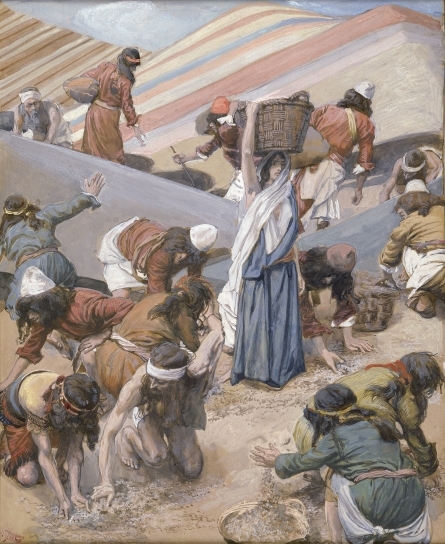 One of Tissot’s hundreds of Biblical paintings in gouache, this reverts to the narrow approach of the Renaissance, with its focus on the effort and methods of harvesting manna. It therefore considers only the third phase, once again. It has been popular to depict the most basic story, in which manna falls from heaven and is gathered by the Israelites. There are several, probably many, paintings which tell that story with great beauty and simplicity. Building a bigger and more enthralling narrative, with enhanced meaning and interpretation, is a much harder problem for the painter. Only by abandoning temporal unity was Poussin able to tell the complete story with its peripeteia. That called for an ingenious and intricate composition which employs small groups of people across the canvas, with visual links between them, and astute use of light and colour. The result is not facile, it is not an instant feelgood impression, but a painting that absorbs the eye and the mind, and brings lasting delight. McTighe S (1996) Nicolas Poussin’s Landscape Allegories, Cambridge UP. ISBN 978 0 521 48214 1. Mitchell C (2016) Units of vision and narrative structures, upon reading Poussin’s Manna, chapter 1 in Cooke P & Lübbren (eds) Paint and Narrative in France, from Poussin to Gaugin, Routledge. ISBN 978 1 4724 4010 5. Posted in General, Painting and tagged Bacchiacca, Bronzino, de Vos, Luini, narrative, painting, Poussin, Reni, Tiepolo, Tintoretto, Tissot. Bookmark the permalink.